Yes another Disney post I am not afraid, if your a regular reader/visitor you will know by now me and Spud are Disney obsessed, we of course like other things too but give us something Disney and we are your favourite friends! The lovely team over at Spin Master sent me and Spud a range full of wonderful Monsters University toys, first up we reviewed the Sulley Mask of which you can read the review here, and now its time for Who's Behind The Door! 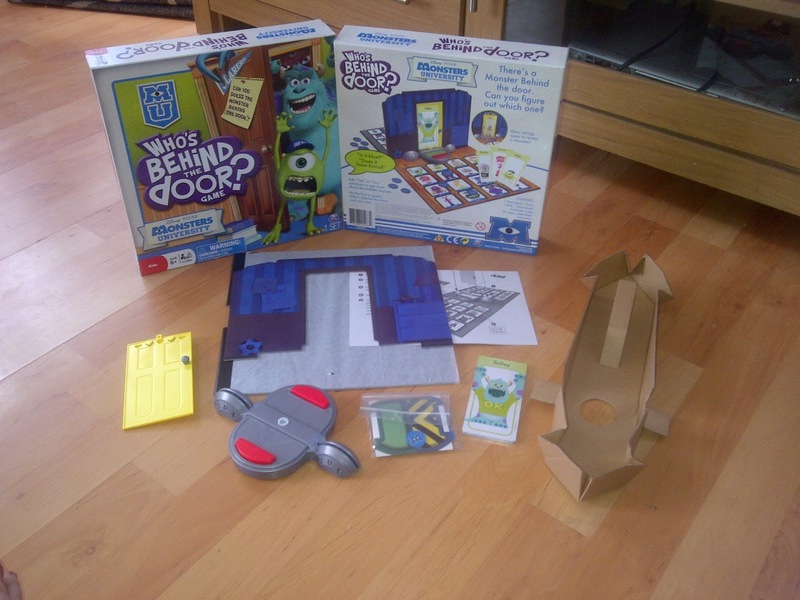 Who's Behind The Door is a board game that Spin Master have very cleverly designed, for a first expression its similar to the board game Guess Who, but of course it has a total Monsters University spin to it! Inside the box you receive one game board, a door, a wall, a door holder/spinner, 16 Monster's University (MU) character cards and 32 MU tokens, instructions and a set of small stickers that take less than a minute to apply! Assembling the game is extremely easy, you take the door holder pictured above with a red button either side of the board and apply that to the area cut out to fit its shape, simply slot the door holder into position and add the door and wall ready for your game to begin. The game is recommended for ages 6 years + and is suitable for two players, given this, and being the old Disney fan I am, I decided to have a game with Spud. Each player is given 16 MU tokens, and a card from the shuffled deck face down, the remaining cards are placed face down to the side. 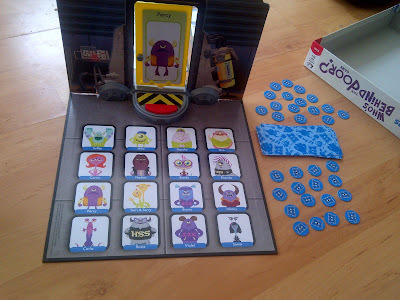 With the card each player is dealt, they place their card onto their side of the door, the card simply fits into place held by a small curved plastic holder. 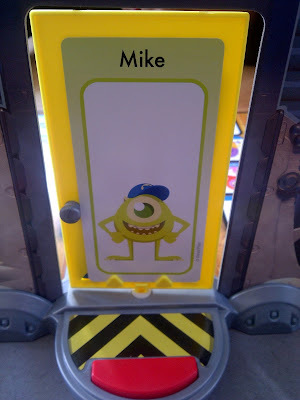 The idea of the game is to be the first player to guess what character remains behind your opponents door. 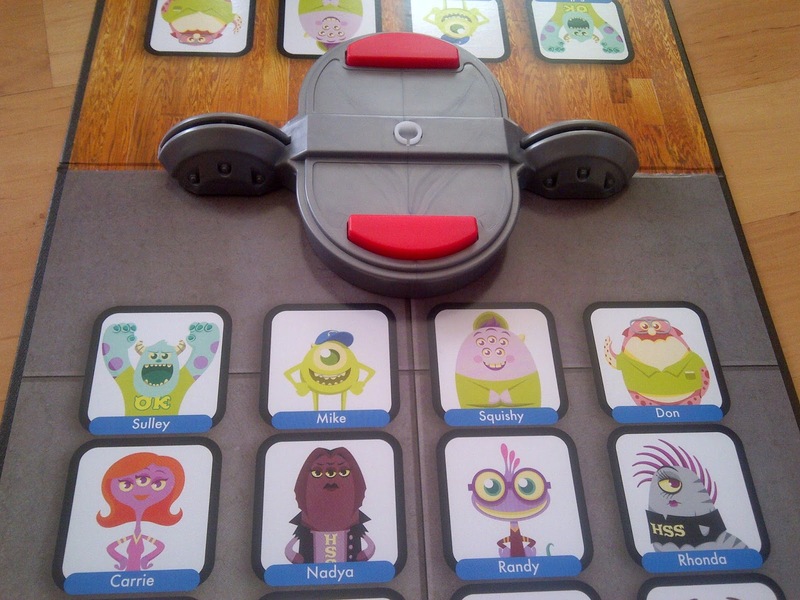 Using the board each player has in front of them, they can ask questions to receive a yes or no answer. For example I could ask Spud if his character was a girl? For which he would give me a simple yes or no answer, if Spud said no, then I know the card he has is a boy, meaning I could place tokens on all the girl characters, illuminating them from the guess. 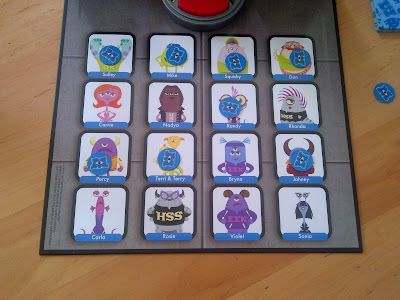 Once you have just a few characters left on your board without tokens on top, you then know that your opponents character must be one of the few remaining characters. If you think you know the monster hiding behind your opponents door, you can make a guess, if your right you win the game, press the red button and flip the door to see the monster you guessed right! If your guess was wrong, you do not get to press the red button and instead just keep playing until one player wins. 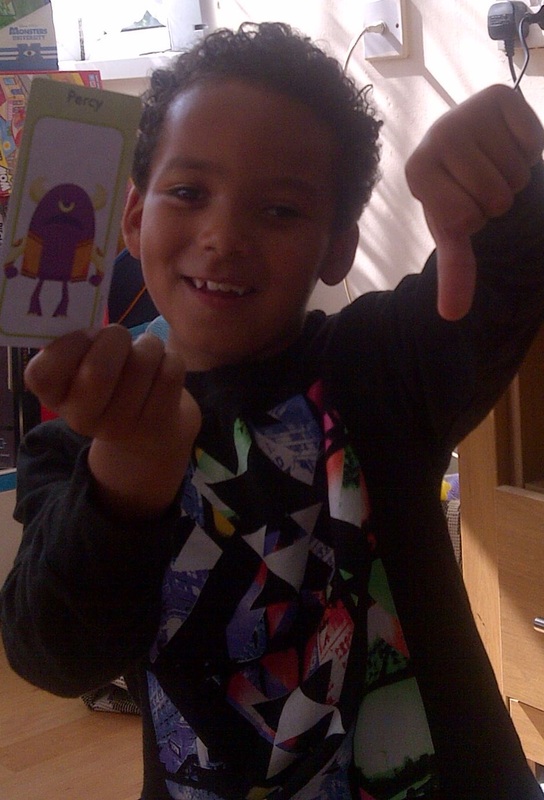 As you can see Spud was very proud to know he won, and shared me the looser sign :(. 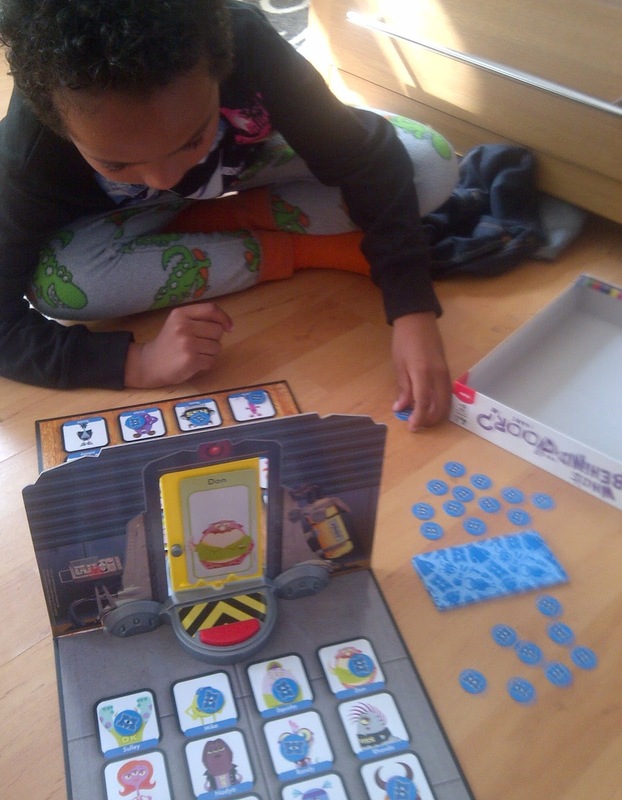 The game was great fun for both of us, we enjoyed the game so much we carried on playing until there was no cards left for us to play with! Spud did not find it difficult at all to play the game and I believe the age recommendation of 6 years + is perfect. 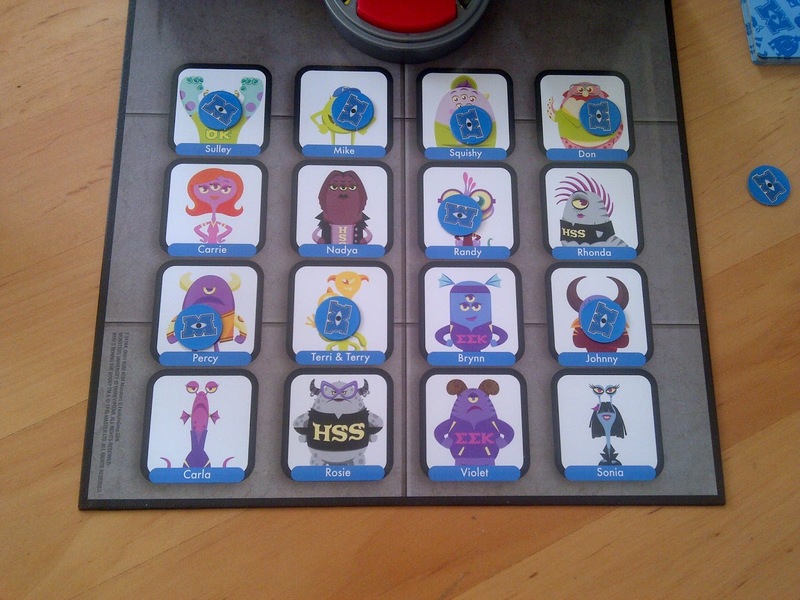 Spin Master Monster University Who's Behind The Door game is available to buy with a suggested RRP of £16.99 from Argos, Asda, Debenhams, Amazon and smaller independent toy stores.